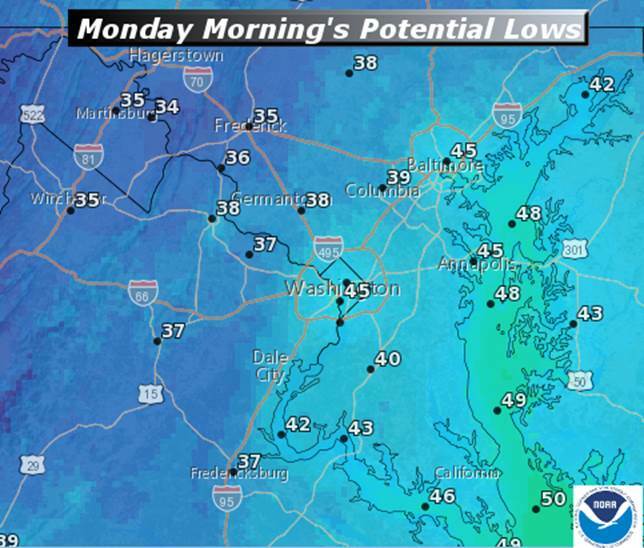 In the D.C. area, Monday morning will start with frost concerns before temperatures rise later in the day. Editor’s Note: This article is intended as an in-depth but plain language discussion for the Washington area’s weather factors, ingredients, and the uncertainties involved. For the latest Storm Team 4 Forecast details, check out the main WTOP Weather Page. WASHINGTON — Two blocked patterns dominated the weather for most of the month, bringing the area some needed rainfall. But of course, they also brought a long period of dreary weather. As the pattern broke down and began to change over the weekend, first there were strong storms on Saturday, and the chilly, blustery winds on Sunday. High pressure from central Canada began building in overnight Sunday into Monday, which on one hand helped to clear the skies and get rid of the winds. But when you combine the latter with the very dry air, you can get some pretty cold temperatures. In fact, Monday morning is starting out with frost concerns in the normally colder spots of the Blue Ridge and the Shenandoah Valley areas. Any frost won’t last long, however, as clear skies and sunshine will warm the area quickly in the morning hours. 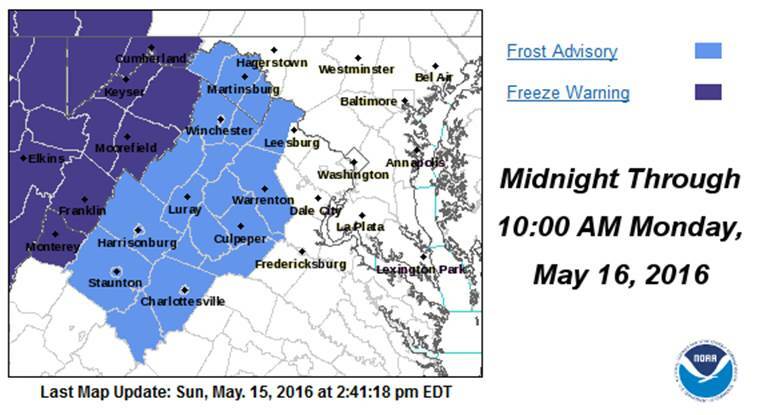 As of Sunday afternoon, the counties in the formal Frost Advisory, as issued by the National Weather Service office in Sterling, Virginia are below and shaded in light blue. As mentioned earlier, the overall weather pattern is not blocked anymore, so the next system will be quickly heading this way by the end of Monday. 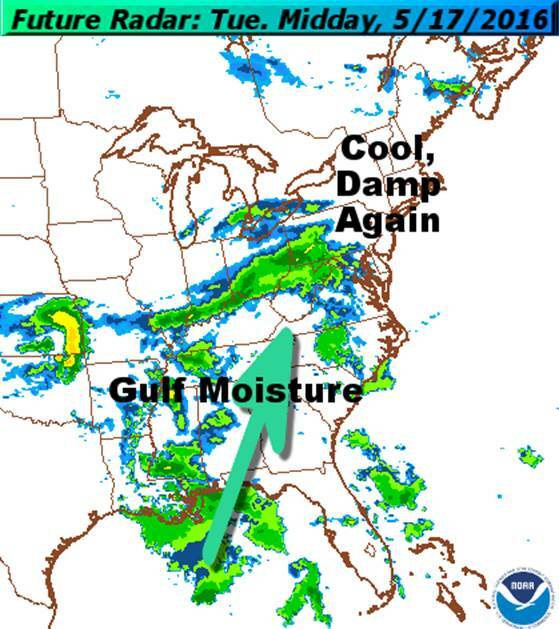 A warm front will be forming along the Gulf Coast and an area of low pressure will lift it toward the region. At the surface, the front will have trouble making it all the way through. Clouds will already be increasing Monday evening. Those clouds will keep the region from cooling off as much Monday night. But then the clouds, northerly winds, and rain arriving will keep Tuesday cool and damp. The initial reaction to that is probably, “here we go again,” but in this newer, progressive weather pattern, the rain will likely last little more than 24 hours. 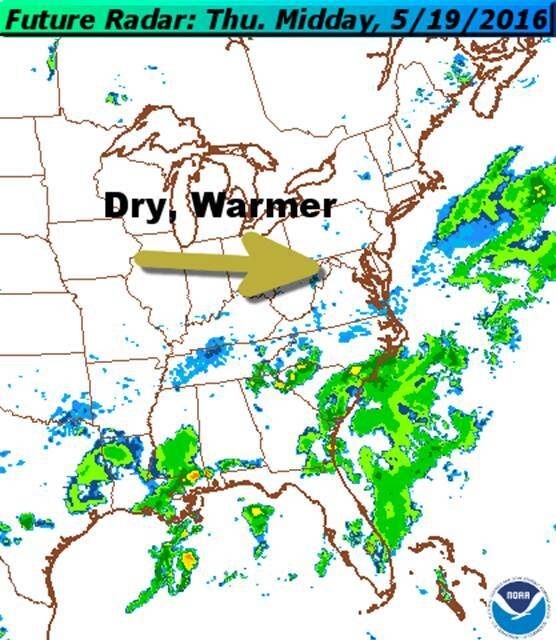 Another area of high pressure with less cold air will start the drying out process later Wednesday and should keep the area mostly dry the rest of the workweek. How chilly was Sunday? At one of the big area airports, it was record setting. At Dulles International Airport, the temperature maxed out at 59 degrees (subject to later verification). This breaks the old “low daily maximum temperature” record of 62 set in 1968. The other area airport records were cooler than that and go back further in time, likely owing to the age of their record books. The record “cold high” for Washington on Sunday is 54, set in 1878. The record cold high for Baltimore on Sunday is 54, set in 1908. 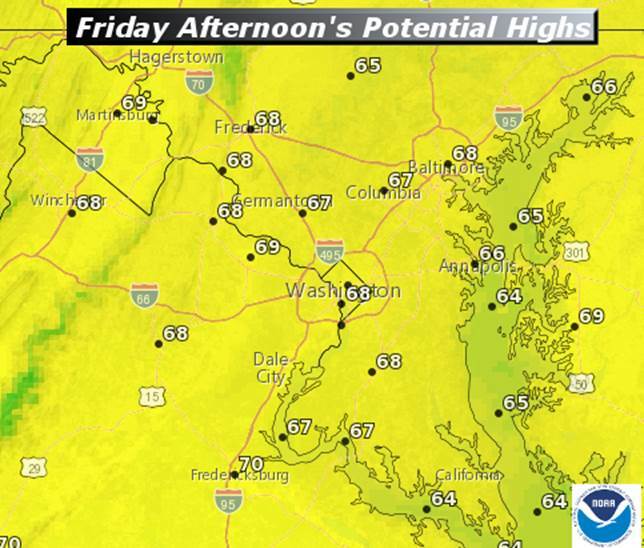 Washington-Reagan National’s actual high was 62 and BWI’s was 60, so those records stand. Morning low temperatures will be much closer to mid-March. Possibly damaging frost to sensitive annuals or garden crops in the western suburbs. Afternoon highs still below averages (mid 70s) but it will feel much milder than Sunday by comparison. High level clouds will be lowering and thickening through the late afternoon and evening. It will not be as cold Monday night or Tuesday morning. It will be another overcast day with temperatures will below average. There will be a potential for light to moderate soaking rain. Rainfall deficits will likely shrink some more. Steady rain early will taper to just a few scattered showers and end. Some clearing is possible by the evening rush. If enough sunshine comes out sooner and if the warm front does manage to make it through the area, some spots will be much milder than Tuesday. High pressure settles overhead and brings mostly sunny skies, more seasonable temperatures during the day. It will be cool but just comfortably cool at night. Weather will feel much more like the month of May. Does pollen start getting higher again? These next two images are from the North American Mesoscale Model for future rainfall, generally comparing Tuesday to Thursday. 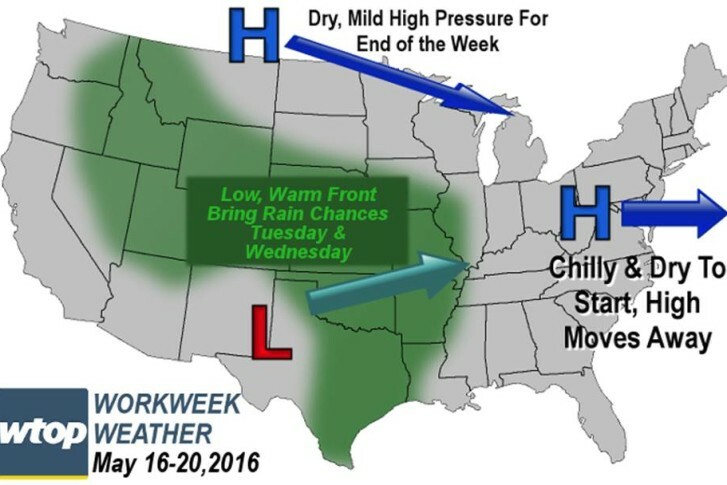 Rain arrives Tuesday and is gone on Thursday. Wednesday is a “transition day,” i.e. the showers will be ending. The next two images are National Weather Service forecasts for Monday morning’s low temperatures contrasted with Friday afternoon’s high temperatures. Comparing lows to highs may be a bit unusual, but it certainly shows it’s going to feel like spring starting on Monday morning and by the end of the workweek, it’s going to feel like it’s well into the season, which, of course, it is! As a matter of fact, Friday has potential to be even warmer than shown.